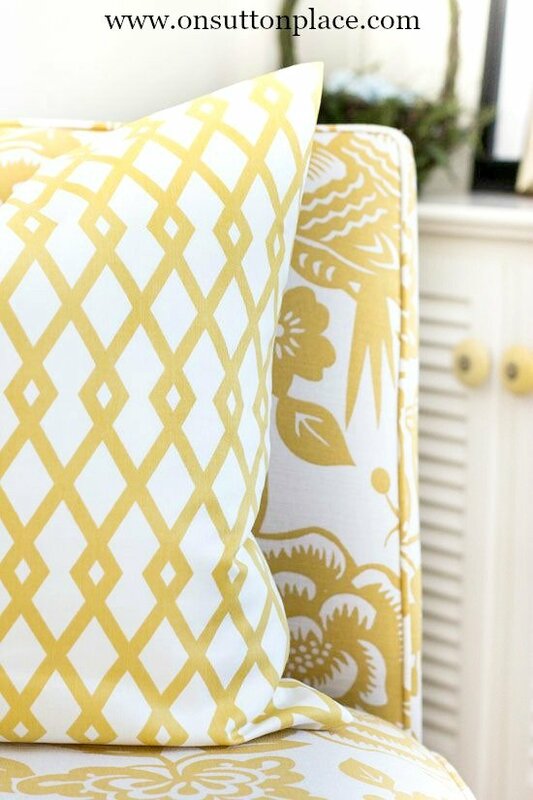 5 Tips for Mixing Fabric Patterns: tips and tricks from a DIY decorator that are super easy. Get the look you see in magazines all on your own! If you have followed my blog for very long, you know I am a lover of fabric. I sometimes buy it without even knowing where it will end up. Mixing and matching fabric patterns may seem daunting but if you follow just a few rules, you can get the look you see in magazines at a fraction of the cost…and even if you don’t sew. My philosophy, and it’s not shared by some designers, is to use the same colors in all the main rooms of your home. Not only is it easier, but it allows you to move your soft furnishings from room to room for a completely different look. It literally expands your decor and the possibilities are endless. For example, instead of investing in a rug for one room, you will be buying a rug that you could possibly use in every main room of your home. In my case, I have the same colors in my entry, living room, dining room and kitchen. I don’t have an open concept home but by using the same colors throughout, there is flow from room to room. 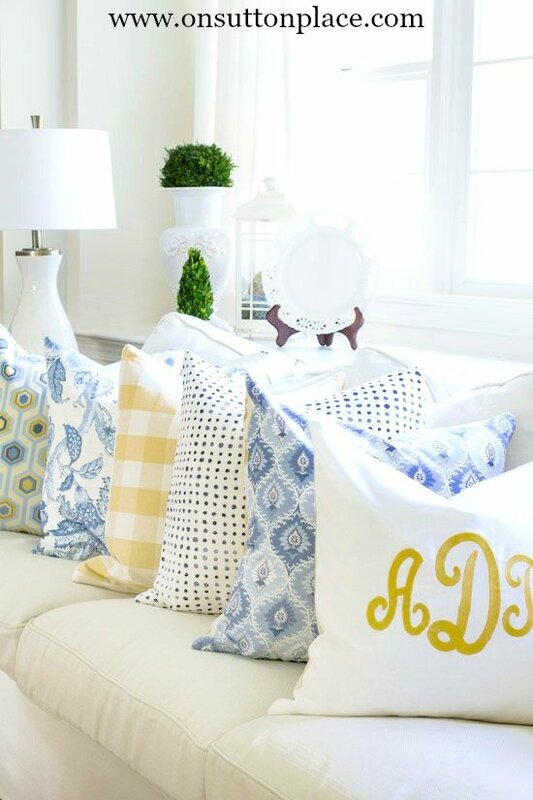 These 5 tips for mixing fabric patterns will work for any space. 1. PICK TWO COLORS AND A NEUTRAL. Start with two colors that work in your space. Think about this for a while, decide and then stick to your decision. Believe me, I know how tempting it is to throw in another color…and you could but not when you are just getting started. It helps for these colors to be on your biggest pieces, like sofas and rugs. In my case my two colors are blue and yellow…and my neutral is ivory. Whites and ivories make great neutrals but so do grays and blacks. 2. PICK AT LEAST THREE DIFFERENT PATTERNS. This is where your own style will come in so just choose what you love. The only rule is to stick with the two colors you chose in step 1. Some examples of patterns are florals, stripes, plaid, geometric, checks, toile, chevron, animal print. 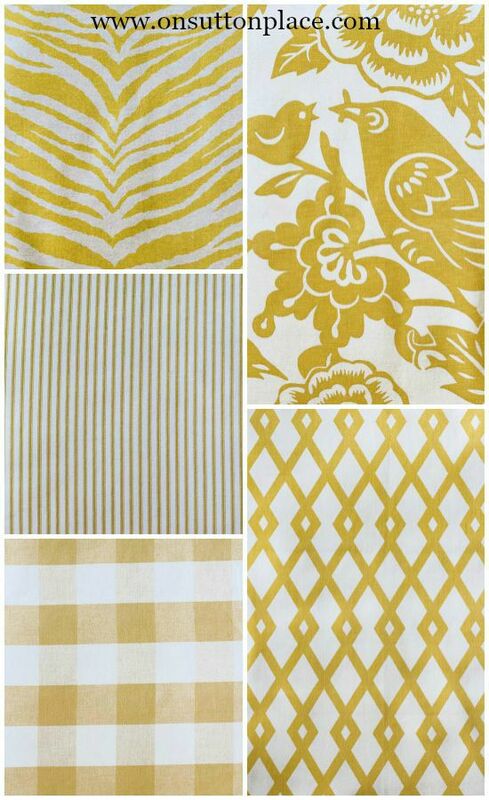 Here are the yellow patterns I use in my main living spaces. 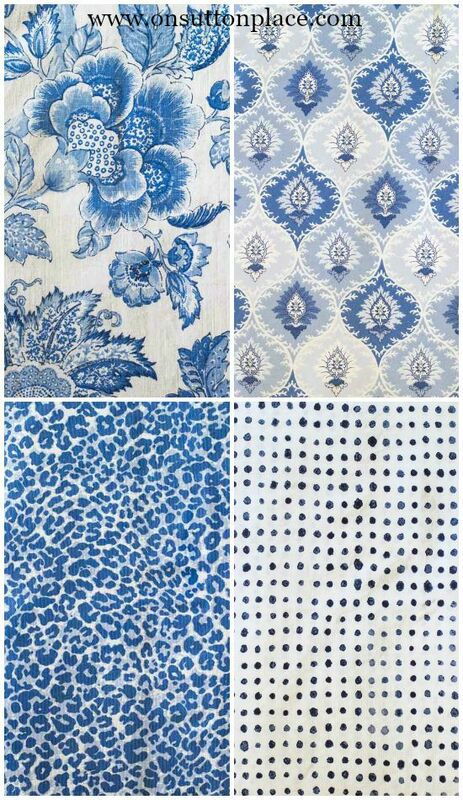 Here are the blue patterns. 3. PICK AT LEAST ONE FABRIC THAT HAS YOUR TWO COLORS AND YOUR NEUTRAL. This fabric will be what makes all the other patterns work together. Use it wherever you can along with the other patterns that you have chosen. 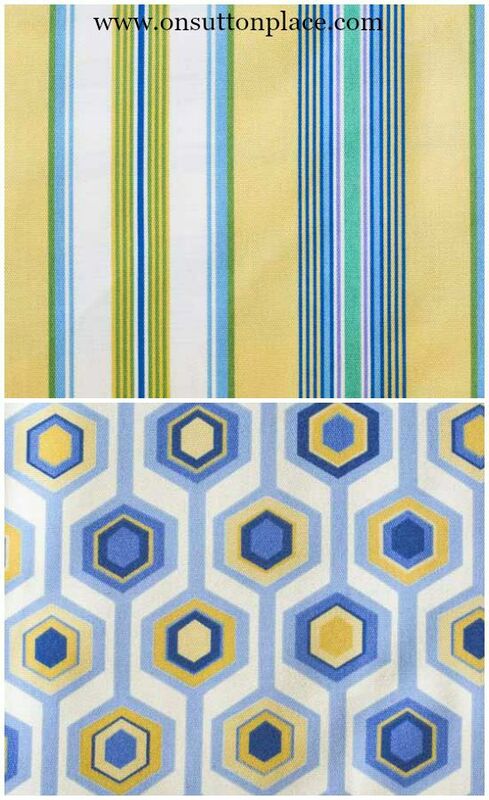 Here are two fabrics I use that have both blue and yellow. 4. VARY THE SCALE OF YOUR PATTERNS. Your patterns should be different sizes. For example if you have a very wide stripe, use a smaller floral pattern. If you are using a large buffalo check, use a smaller stripe such as ticking. Don’t use all stripes…or all florals. 5. DON’T BE AFRAID TO BREAK A RULE! Try to mix it up a little without over-thinking it. At the end of the day, if you fall in love with three large scale patterns, and they follow the color rule, chances are they will work just fine. I honestly pay more attention to color than scale. If I fall in love with a pattern, I tend to use it whether it follows all the rules or not. The one rule I don’t break is keeping with my two main colors, with one exception. I do add seasonal colors. In the Fall I bring in browns and oranges…and at Christmas I add reds and greens. Christmas Pillow Covers available in my Redbubble Shop. 5 Tips for Mixing Fabric Patterns Bonus: Throws and rugs are important. Not only do they add layers but they add texture as well. Stick with your colors when purchasing these items and you will be able to freely move them from room to room. 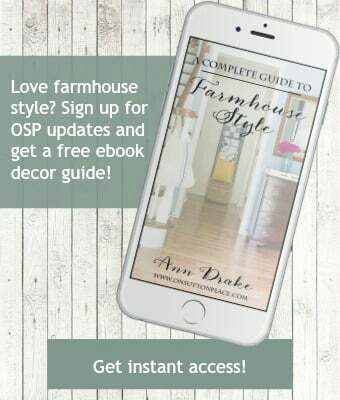 Are you a member of the OSP family? Today is DIY Tips and Tricks day so here is some more inspiration for you. These girls are absolutely the best so if you have an extra minute, please stop by their blogs. Thank you and see you soon! My main colours are yellow and navy so cosy. I don’t sew wish I did because it is so hard when you go out to buy pillows you can never find what you want and I love pillows. I am always changing my colours, it gets expensive lol. I always LOVE your fabric selection Ann. So crisp and fresh. 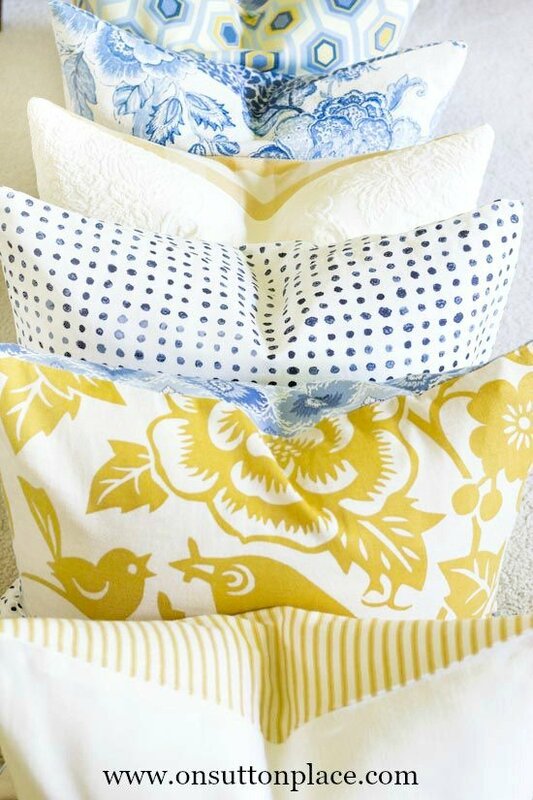 But the thing I think is the most genius is different fabric for each side of the pillow! If you’re taking the time to get a custom look by sewing something yourself why not double the pleasure. My husband adores your yellow and blue color scheme. It’s his favorite. And so smart to do your whole downstairs in it. The flow is easy on the eye and beautiful. Great tips! I’ll be using those when I start to make some decisions on colors. You did such a marvelous job on that little table too! It looks really good next to your chair;) I love the colors in your home, Ann! I love the patterns you choose and yes those fabrics look amazing together. Love your blog. Simple ideas and y et the results are great!!! Very nice….simple and to the point! I can never recall the “correct” mix for patterns and colors and detailed it perfectly. I shudder when i see some designer rooms that have every color under the sun and they don’t seem cohesive. You have such a lovely home and design esthetic!! I’m with you on this one! I do exactly the same thing! I move stuff from room to room and people are constantly saying, “oh, that’s new” and I say no, it’s from another room! I think that’s just smart decorating! Plus it keeps things fresh and new! Great minds! Actually I think it’s amazing how the look of something can completely change when it’s moved from one room to another. It really is like getting something new! These are great guidelines Anne. I really like your style – it is clean and simple, yet interesting, and I like the way you change things around for the seasons. I am always inspired by your ideas! Thanks for the unique and creative work you do. Thank you for this clear lesson. Your words and examples are just what I needed. I love your pretty but not overdone style. Great posts all the time. Your blog today has helped me decide how to mix and match patterns/colors. I am a very indecisive person, and cannot get my decorating started because I cannot decide on patterns. I have my colors and themes, for my entry way, living room and kitchen/dining room, but I cannot get started. Melinda just buy one or two fabrics to start…or if you don’t sew buy 2 pillow covers. Live with them a while and then add something else. Don’t feel like you have to do it all at once. Just take it one thing at a time. Good luck! Great post! I was near middle age before I learned what you have in this blog. Like your colors but they are so different from mine. That is a good thing, I can enjoy yours. If you are not a quilter, you would be good at this hobby! Part of quilting is choosing your fabric but we go a hair further with values in color. Thanks! I am waiting for your next post! in home furnishings. I do not want a beige table cloth in a table set with white dishes and white walls. Yet I am a white wall woman. Please address this in a future post . My walls are a very light ivory. Honestly, I think white is much easier and I wish I could switch! Thanks! So many great tips! Love it all!! One of my favorite TV decorators, Lynette Jennings gave the same advice about using the same color palette throughout the home for a harmonious flow. I just happen to love your cheerful choices of yellow, blue and ivory! Hi Karen! My favorite designer is Sarah Richardson and she NEVER does homes where the rooms flow. They are all different colors and sometimes even different styles. I could just not live in a house that mixed up! I really enjoy your posts. I love your style and will do my best to incorporate your fantastic suggestions and ideas into my new home. At the moment I at a loss as to what 2 colours I should pick as I have a dark brown leather sofa which unfortunately is to expensive to replace. My neutrals are a creamy white and grey. It is an open concept design and I having a difficult time tying everything together. Hi Rose! If you look at a color wheel, the opposite of brown is blue. A color wheel doesn’t really have brown but it has yellow and orange. So you could use gray as a color and add blue…and use ivory as your neutral. I think blues and grays would look lovely…just a suggestion! I agree – easiest explanation I have ever read and seen. I’m in the process of figuring this out for my living and dining room refresh. as well. This helps tons! Good Afternoon Ann, Thank you for the hints and tips your shared about mixing material patterns. I really enjoyed reading this post. My style is eclectic, as I have moved around the world quite a lot during my life and have bought quite unusual items, but each work together well. I agree with you, I keep the same basic colours in each room and then add more colour. I especially love using paint as it allows me to display my pictures and plates to more effect. I have pinned the yellow combination of materials as I love the Thomas Avery material. I shall have to see if it is available here in England. Thank you for such a lovely comment and best wishes to you as well! Ann, this is the best tutorial on mixing patterns I have ever read…. REALLY!!!! What great information and common sense advice. No wonder I love love love everything you do!!! Your look is crisp, clean, edited and very upscale. Adore it!!! Thanks so much for this very well written post. It”s a keeper! Thanks for the great tips. You made it seem so easy. I have a plaid sofa so it is not so easy for me. I am looking for a slipcover that will give me better options. I love your style!!! I used to have a dark red sofa and it was more difficult to work with. Going neutral on the big pieces does help. Good luck! Love your blog. While I live in a very small old mobile home, I have two huge dollhouses. I live in them vicariously! I’m always looking for specific decorating ideas. There is the challenge of finding the right fabrics in scale. So I also buy scale fabrics in the colors I love. At this time, the beach house has the colors yellows, creams, blues and corals. However, I am having a difficult time with the mansion. I decided to use a leather couch and chair. It has cream walls and dark floors. I am having a difficult time choosing fabrics for leather furniture. And after all, a house is a house is a house. I’m sure there are others with leather furniture in their RL homes. Thanks for any suggestion! It sounds like you may need a light colored rug under the leather furniture so it doesn’t blend into the floor. 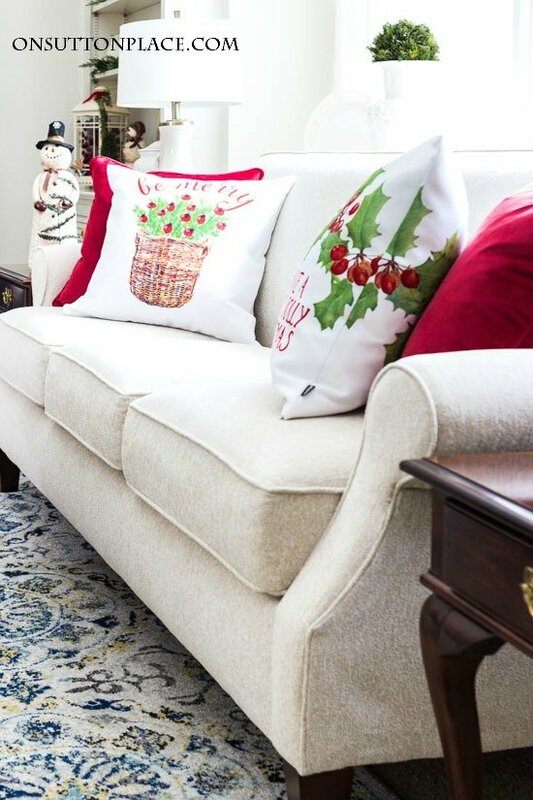 Then use the color(s) in the rug as pillows or throws on the sofa and chair. Hope this helps!